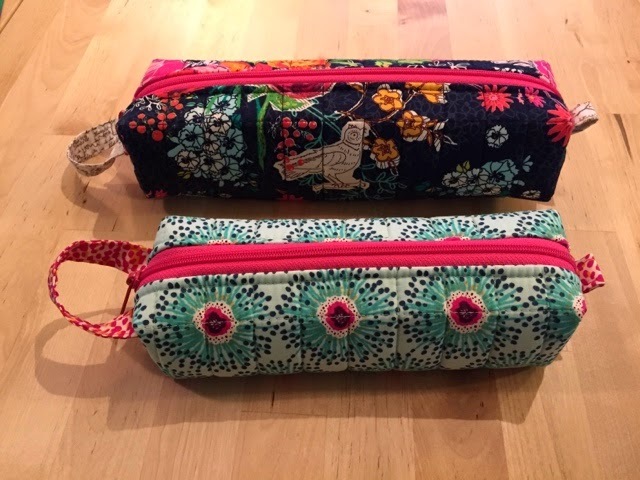 Back down to business today with a review of the Quick Zip Cases from Patterns by Annie! I had some of Katy Jones' amazingly gorgeous Priory Square fabric from Art Gallery Fabrics that I wanted to use for something special, and we all know by now that I'm a bit of a bag addict. So, it seemed like a pretty logical choice. 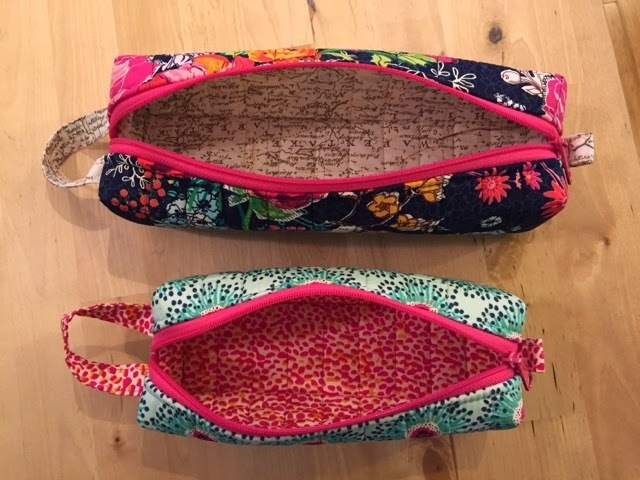 The pattern makes 2 sizes of case, and either size can be made with 2 fat quarters (the pattern calls for 3 fabrics, but I only opted for 2 without needing any additional fabric), a zipper, and a piece of Annie's amazing Soft & Stable. Just like the pattern says, the small size easily holds my 45mm Olfa rotary cutter with plenty of room to spare for other goodies. I'm not sure what I'll keep in the large size to be honest, but I'm sure I'll come up with something! 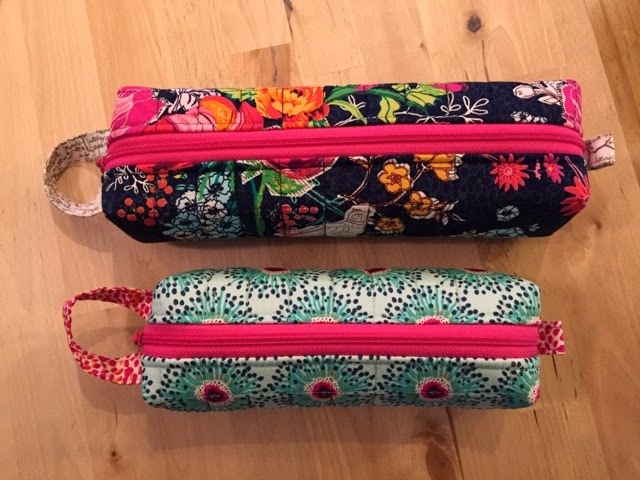 I have obviously been spending too much time on making more involved bags that I was a little surprised at how quickly they went together (obviously, the name of the pattern should have been a clue that they would be quick). I almost spent just as much time picking a fabric/zipper color combination as it took me to make one of the bags. I'd guesstimate the start to finish of making both sizes to be around 3 hours (this includes doing all of the quilting of the fabric to the Soft & Stable). The only concern that I had going into the pattern was in relation to the exposed seams at the boxed corners. I have made some bags that have seams exposed, and I can't say that I'm a fan (even if the fabric is gorgeous and is laminated cotton which doesn't fray). Of course, Annie wouldn't leave a girl like me stuck with exposed seams! 1. I prefer the look of 2 fabrics, so I will continue with that (I think this really has more to do with the fabrics that I choose more than anything). 2. I feel like the carry strap is a little long, so I will make that a tad shorter. 3. Much like I did on the A Place for Everything bag, I did trim back a little bit of the seam allowance from under the zipper so that the top stitching totally encases the seam. I think this is a beginner friendly pattern. Using handbag zippers make inserting the zippers a breeze (handbag zippers have wider tape than a standard dress zipper), the pieces that require quilting aren't very large so they are very friendly to machines without a lot of space to the right of the needle, and the instructions are clearly written. Don't forget that directional fabrics may appear as upside down when viewed from one side (no, I didn't forget that)! So, are there any exposed seams or raw edges inside the bag? That's one pet peeve of mine when making any bag with a lining or boxed corners.